Last June, the Weather Channel (WC) reported on GMOs, but you could hardly call it ‘reporting.’ If anything, it was an opinion piece holding up the values of biotech and the Big Ag industry, including the interests of Monsanto, Dow, Syngenta, Bayer – some of the largest GMO seed producers as well as pesticide/herbicide producers on the planet. 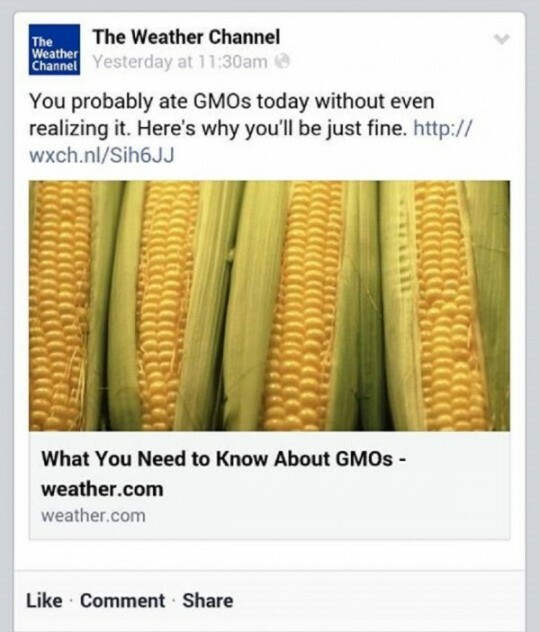 While I have made my own opinions on GMOs very clear, never mincing words with my advocacy of a GMO-free planet, the Weather Channel offered a one-sided piece on GMOs and did not tell the entire truth about genetically modified crops. The headline on the TV station and website’s Facebook page read as follows: “You probably ate GMOs today without even realizing it. Here’s why you’ll be just fine.” The article went on to attempt to paint activists as “anti-science,” a common tactic used by the Biotech industry. Viewers paid attention, and let the WC know just what they thought of their ‘report.’ The network has now come forward with an updated interview, which includes commentary from Jeremy Gruber, the President of the Council for Responsible Genetics, and author of The GMO Deception. The WC interviewer even asks “when pests eat GMOs, their stomach’s explode, is that true?” Gruber states that this fact is true, and that we really don’t know what genetically modified organisms do to us. He also points out that they aren’t tested in any long-term toxicology tests and that government regulators don’t force these tests before the public is exposed to GMOs. The interview is less than four minutes long, but it does offer a more unbiased view of GMOs than the one which the WC previously presented. You can watch the full video, here. The WC also practically ignored the March Against Monsanto which took place worldwide on May 24, as well as published the authoritative-sounding article titled “What You Need to Know About GMOs” which completely leaves out many relevant things about GMOs that people should know. 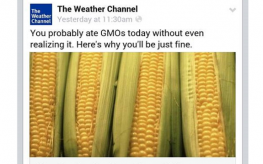 Now, we just need to tell the Weather Channel, who has partnered with Monsanto, to remove their support of genetically modified organisms from their Facebook pages and website, or suffer the consequences of a lesser audience. Shouldn’t the “Weather Channel” be discussing the… weather? competitive paradigm will begin to reverse into one of cooperation. Then, Our unity will have begun and Our collective will will automatically begin to manifest.